The spring season is truly about “optimistic & spiritual romance of two opposite worlds: East and West.” The sensuality, femininity, vibrant colours & textures of the East merged with the practicality, pragmatism and movement of the West. It’s a celebration of what resounds with me most: femininity with a bite. The motifs, embroidery and textures are inspired by the artist Laxman Shrestha and shapes and silhouettes a feminine take on American Sportswear. 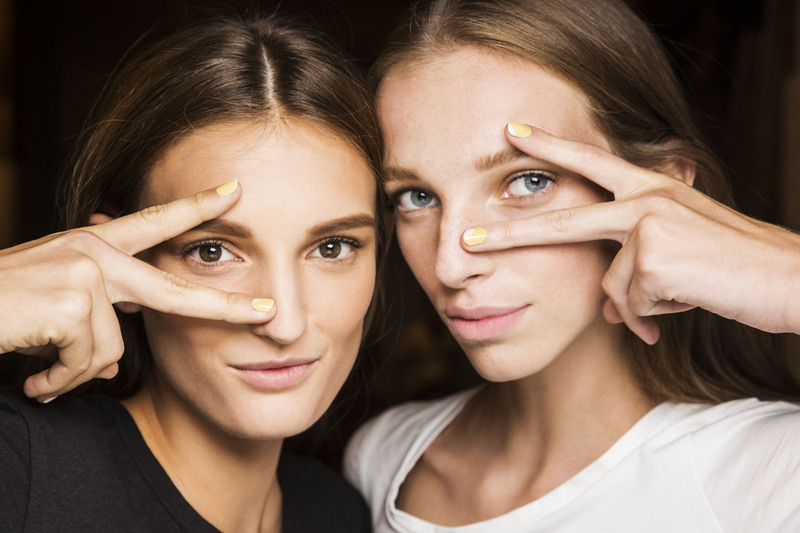 For the eleventh consecutive season, Prabal Gurung turned to Sally Hansen, the #1 Nail Colour and Nail Care brand in the US, and Madeline Poole, Sally Hansen Global Colour Ambassador, to create exclusive nail looks. Mum’s The Word and Let’s Snow are part of Sally Hansen’s award-winning Complete Salon Manicure collection that infuses trend-setting shades with an expert-quality formula to deliver salon-caliber results. Sally Hansen Complete Salon Manicure delivers seven salon manicure steps in one bottle. Chip resistant strength joins gel-quality shine. Must-have colour meets nourishing benefits. Plus, with a built-in base and top coat, it’s everything you need to achieve a professional manicure at home. Sally Hansen Global Colour Ambassador Madeline Poole is a nail expert working in New York and LA. Trained as a painter, Madeline worked odd jobs like vintage poster restoration as an art student in Baltimore. Her unique talent in crafting innovative designs, emphasis on skin care and attention to the hand as a whole makes her one of the most sought after names in the beauty industry. As part of the collaboration with Sally Hansen, Madeline will help set the artistic direction for a new generation of modern nail looks and collections with her fashion-forward vision on a worldwide basis.